The bright lights, big city concept was certainly born in Midtown Manhattan on the West Side of town, where Times Square and the Theater District are at the core. This bustling area offers everything from performing arts to culinary delights. Midtown West spans from 30th Street to 59th Street on the west side of Fifth Avenue over to the Hudson River, and is home to many of Manhattan’s most frequented attractions as well as arts institutes like Carnegie Hall and Alvin Ailey. It’s also close enough to Central Park for residents to take advantage of the greenery and activities that await them there. And restaurant row on Ninth Avenue can’t be beat for great eats. Midtown West is also first and foremost an easy commute - in walking distance to A, C, E, B, D, 1, 2 and 3 trains, bus stop on the corner of our block. Our building is located on the corner of 53-rd street and 9-th avenue. It is in a walking distance of many famous New York City sites:Times Square, Rockefeller Center, Central Park, Columbus Circle, Lincoln Center, Radio City Hall, MOMA etc. The rental combines the luxuries of a high class hotel with the comforts of a modern home: dining area with table and chairs, full kitchen supplied with various appliances; fully equipped bathroom (shampoo, hair conditioner, bath gel and hair dryer are provided). Our centrally located cozy rental comfortably accommodates 7 people: has a queen size bed in the bedroom, 2 queen size convertible sofas in the living room and a folding bed. Elegantly furnished with new modern furniture, the apartment is spacious and sleeps 7 comfortably. Luxury linens, chenille comforters, a large LCD TV, DVD player, CD player, high speed WiFi Internet and cable TV to enjoy your New York experience. There is a 24 hours concierge in the lobby, laundry facilities, gym and roof top on premises. The laundry room is located on the ground floor. In order to use the laundry machines you need to buy a card, using your credit card. This apartment is suitable for business travelers, couples and families alike. All prices are for 2 adults. $15 for each additional person. Christmas, New Year, Easter, Thanksgiving, 4th of July. 1. 50 % of payment required to book the rental. The balance is due upon arrival. 1. If cancellation occurs 45 days prior to arrival date, all payment minus processing fee is 100% refundable. 2. If cancellation occurs less then 45 days prior to arrival date, payment is not refundable. If you have any questions we will be more then happy to answer them. Please, contact us at 917-592-5540. Thank you for the interest in our apartment. Shampoo, conditioner and body wash provided. Hair dryer, magnified mirror, toilet paper and plenty of towels are available for your disposal. Very clean and well appointed. 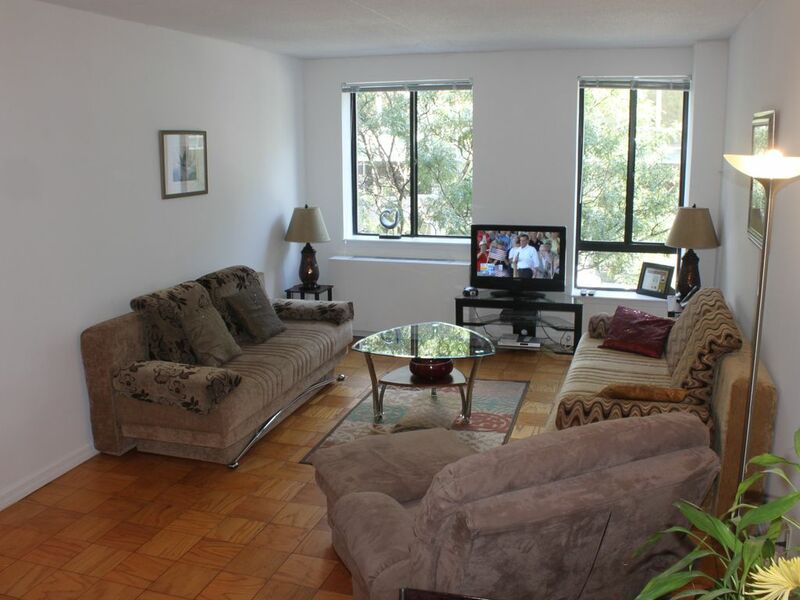 Safe and very close to the theater district. Very clean and well appointed. Safe and very close to the theater district. Very helpful to have a concierge at the front desk. The bedroom does face the street, although it is a relatively quiet street. There is still some traffic noise that is heard when trying to sleep at night. The owners are very accommodating and attentive to any concerns and questions. Overall, a great place to stay. We will definitely rent here again. We had a wonderful stay while in New York. This apartment is THE perfect location and price! We had 2 adults and 4 kids and we all had a place to sleep, and plenty of linen. Yes, it could use some updating but we weren't there to stay inside, we were there to explore New York, so the updating wasn't an issue for us. We would stay here again! *Our kids are older so they don't need running around room. I will say that little kids that need to run, this is not the location for that. Great location. Nice apartment. Good price. Neighbors' smoke was problematic. Overall, we enjoyed the unit. Comfortable beds/couches. Well equipped kitchen. Good price for the winter. The heater in the bedroom essentially didn't work, but that wasn't much of a problem. The one major challenge is that one or more neighbors smoked...just about every night...sometimes cigarettes, sometimes pot. The smell filled the hallways, and leaked into this unit. As the night would go on, the room would get more and more smelly. If the weather is nice enough, opening the window solves it, but in the winter that isn't a great idea to do for long. Not sure why the smell spread so well, but its something to resolve. we are glad you have enjoyed your stay. Communication is the basis for success. You have never contacted us to seek our help to resolve any issues. The "next" guests called us right away letting us know there was a problem with the heater in the bedroom. The filter was substituted and the issue was resolved in 10 minutes. When it comes to smoking the management takes the problem of smoking very seriously. On March 1 the management sent out letters warning that any person caught smoking would be evicted. It is prohibited to smoke anywhere in the building including the roof top and outside next to the building. We could have complained to the management of the building and report the tenants for disturbing the whole floor with smoking. Too bad we didn't hear from you. We are well-known to address any problems immediately. Perfect place for us to stay, great location! This apartment had everything we needed, and Laura and Irina were on hand for any questions we had. Would definitely stay here again. Great location to all midtown activities. In restaurant row, with authentic eats within an easy walking distance. Clean apartment, easily slept all 5 of us. Owners were great at being accommodating and communicating well with us. Safe area, doorman building. The best thing about this place is the location! The only thing I have to complain about are my blistered feet because so much good stuff was in walking distance! The place itself was nice and fit our families needs. Plenty of towels and extra blankets and sheets. The owners are very responsive via text message. However BEWARE of the messages you get from VRBO. They have the owners old property address on there and can be confusing. Laura was able to straighten that out for us. The apartment is in a nice complex. Overall very happy with our stay.